Coffee was first grown commercially in Colombia in Salazar de las Palmas, north of Santander, and over the twentieth century grew to be Colombia's primary export. When coffee was first brought into the country, the leaders tried to push the farming of coffee beans, but was met with resistance from the people because it takes about 5 years until the first harvest of the bean. In 1999 coffee revenues represented 3.7% of gross domestic product (gdp) and 37% of agricultural employment. The main coffee-producing departments are: Nariño, Norte de Santander, Antioquia, Valle del Cauca, Huila, Tolima, Caldas, Risaralda, Quindio and Cundinamarca. The area between the departments of Caldas, Risaralda and Quindío is known as the Coffee Zone because of the large development experienced by the cultivation of this product. This region was strongly affected by an earthquake that was 6.4 on the Richter scale on January 25, 1999, but subsequently the region's economy recovered rapidly. Weather conditions (8 °C to 24 °C), geographical (Andean Rainforest) and the geological region, determine the production of high quality coffee, with relatively short harvest periods. Farmers in the area have developed techniques for growing, harvesting and processing of grain, and all done "grain by grain", and have retained this form of processing industry despite new techniques of mass agricultural industrialization. The famous advertising icon "Juan Valdez", represented by a Paisa farmer wearing a carriel, aguadeño hat and poncho, and accompanied by a mule, has become a triumph of advertising communication. Juan Valdez has been considered in United States as the advertising image of greater recall among the inhabitants of that country in the year 2005. “The coffee axis” and “The coffee triangle”, are different from the “Coffee Cultural Landscape” (es: Paisaje Cultural Cafetero) in Colombia which is inscribed on the World Heritage List by UNESCO, 2011. The region has developed major theme parks such as the Colombian National Coffee Park located in the town of Montenegro in Quindio. In the area is also the Museum of Culture Coffee, showing the process from grain production to savoring a traditional Colombian coffee. This museum, like all the other theme parks, are replicas of the colonial city, where tourists enjoy dance performances and traditional music, panoramic views from cable car with its lush landscape, and various rides. Another unique theme park in Colombia is the National Park of Culture Agriculture - 'Panaca', also located in the Municipality of Quimbaya in Quindio. Its key feature is that, unlike zoos, visitors are immersed in a personal and direct contact with farm animals and also enjoy scheduled activities and events with those animals. The Matecaña City Zoo in Pereira, one of the most important traditional zoos in Colombia and South America, has 150 species and 800 individuals, distributed in 239 mammals, 172 birds, 57 fish, 111 reptiles and 5 Of note, the high rate of reproduction, making even a few years ago the crossing of an African lion and a Bengal tiger, resulting in the 'Ligre'. It also has the important Museum of Nature within. 'Botanical Garden of the University of Pereira' as one of the largest in Colombia as the only listed by the BGCI as natural or Sivestre, but also for being one of the orchid s in the world. 'Santuario' is one of the most characteristic towns of the region, is known for its tradition paisa's architecture and streets. It is close to PNN Tatamá. 'Thermal Santa Rosa de Cabal', a "Spa" Spa for bathing in hot springs and different activities for relaxation and body care. 'Rafting on the Rio la Vieja': Walking the Rio La Vieja on the border between the departments of Valle del Cauca and Quindío, from the town of Quimbaya.
' Extreme Sports' Tour operators in the region offer kayaking on the River Barragan, paragliding in Calarcá, among other sports. 'Cocora Valley' in Salento, home of the national tree Palma wax Quindío one of the most beautiful spots around the axis coffee one of the entry points to Los Nevados National Natural Park where there are also entitled to stay and camp sites.
' Quindío Botanical Gardens', located in the town of Calarcá, where you can also see in the butterfly with the largest exhibition of butterflies in the country. Tourist excursions offer trekking to some of Colombia's top coffee cultivating land as well as the country's native palm tree - the Wax Palm, which grows up to 60 metres tall. Wikimedia Commons has media related to Colombian Coffee-Growers Axis. 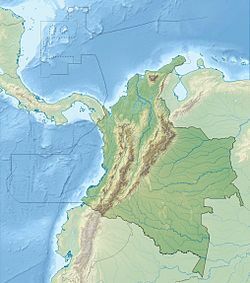 Wikivoyage has a travel guide for Zona Cafetera. This page was last edited on 13 April 2019, at 23:35 (UTC).